Winners are grinners (Mike, Kishor and Anil) of Patong. Patong were coming off a loss to Laguna last week and were seeking to get off the mark this season with their first victory. Meanwhile, ICC was feeling confident going into the match after a comfortable win against the Village in their last outing. Patong eventually ran out winners after posting a very solid total of 160 runs from their 20 overs and then bowling ICC for 108 in the 17th over. ICC conceded 45 extras during their stint in the field (including 37 wides) which boosted the Patong total score. 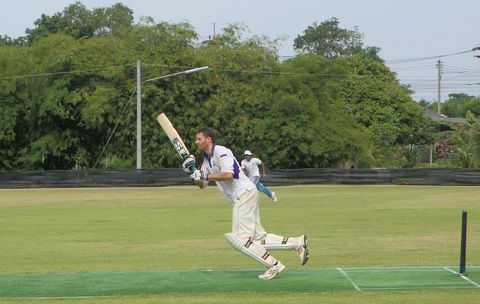 The other telling difference between the sides was a brilliant fielding display by Richard Desmond of Patong who bagged three catches, including the catch of the season, at full-stretch and diving at mid-wicket to wrap up the ICC innings. ICC won the toss and decided to put Patong into bat first hoping to contain their innings to a achievable total. They got off to a good start dismissing opener, Richard Folds (0) early on. However, Richard Desmond (27) and Rishi Sadarangani (30) steadied the ship with a 62 run partnership which including a towering 6 by Sadarangani into the adjoining rubber plantation. Meanwhile, Sadarangani’s brothers, Manesh (13) and Kishor (14) also made valuable contributions as did Anil Rawat (23) towards the end of the innings. Some wayward bowling by ICC which included 37 wides did not help their cause in containing Patong who finished on 160-9 after their 20 overs. Pick of the bowlers were Anand Chand (2 for 15) and Surendar (“Zola Bud”) Kumar (3 for 9) who came on for the final over and bagged a treble. After the innings break, ICC knew they would need to get off to a solid start if they were to have any chance of reaching their target of 161 runs. However, they suffered an early set back when Darshan Vaigankar (0) was clean bowled in the 2nd over. Patong nabbed another scalp the very next over with Seemant Raju knocking over the stumps of Naeem Ul Haq (1). Imtiyaz Mushtaq (17) and Virender Kumar (23) put on a 40 run partnership but this ended with the first of Richard Desmond’s catches after Kumar skied a high ball out to mid-wicket. ICC captain, Anand Chand (35) top-scored for ICC and showed some dogged resistance. However, he did not receive any support from his fellow team-mates with no other batsmen reaching double figures. The ICC innings finally came to an end with the score on 101 in the 16th over with the catch of the season by Richard Desmond. Pick of the bowlers for Patong were Anil Rawat (2 for 14), Manesh Sadarangani (2 for 6) and Kishor Jhagta (1 for 12). Next weekend at the ACG on Sunday 5th August at 9am, sees current T20 champions, Laguna, take on the Village who will be looking to avenge their defeat in the Island Furniture League final and get amongst the points. The beers will be cold but the action hot. 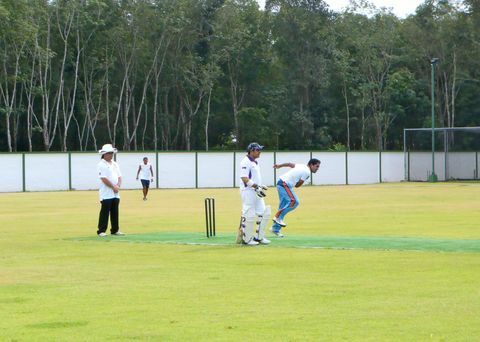 Visitors are welcome to come along and see Phuket’s cricketers pit their skills against one another. After 3 league matches, Laguna remains on top and undefeated.